As we were driving into the community yesterday, I noticed a small girl and boy holding hands and running towards us to meet the vehicle. The girl, slightly older, was pulling the boy along, and she pulled just that bit too hard and he fell flat on his face. She helped him get up quickly, dusted him off, and they proceeded to run towards the vehicle. I didn’t think too much more of it, as on arrival, we were swamped by 50-100 kids all trying to shake hands and greet us. However as we started out for our home visit, I found out we were going to visit the home of these two children, and I also found out that the small boy, Katanga*, who is only 4 years old, has gone blind this past year. Up until 3 years old his vision was fine, but it has recently deteriorated to the point where he has no vision. He is one of 3 children. His father, who also suffers from a physical disability, spends most of his time in neighbouring Congo, making charcoal, for the family to be able to sell and generate a small income. He is mostly absent. Katanga has a 6yr old sister, who faithfully drags him around places acting as his guide now that he cannot see. He also has a 2 year old brother who has been diagnosed with bone cancer, and is away with his mother at Zambia’s best hospital in Lusaka (6hrs by bus, away from where they live). An operation has been performed on the legs of this baby, and we hear that they want the baby and his mother to stay at the hospital in Lusaka for the next 6 months. This means, that currently Katanga and his sister are being cared for by their Aunty. Their Aunty is only around 22 years old, and you can see the worry and burden she is having to carry to care for her own child and now also her niece and nephew. She is surviving by selling small piles of charcoal in her community – a pile of which sells for the equivalent of AUD $0.25. I ask for prayer for Katanga. Our local African leaders, working with the volunteers in the community, have made a plan for Katanga to go and visit an eye doctor in town with his Aunty this coming week. We have some hope that his condition may be able to be treated and his sight might be able to be restored. Hopefully it’s not too late. Pray also for his mother and baby brother in the hospital. It’s not a good situation for this baby, and it’s also very hard on the family trying to support the Mother to stay with him in Lusaka for an extended period of time. 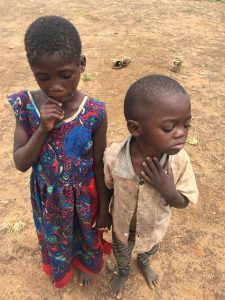 Also pray for the Aunty caring for Katanga and his sister that she will have the strength to face each new day, and that she will stay committed to caring for these children as her own.